PG&E is replacing a 12000 volt switch–down the street from my house in El Granada. Power went out early this morning and the PG&E guys (all of them very handsome) had to dig a giant hole to pull the old sopping wet thing out and replace it with a new shiny one that works. By 1925 much of the Bay Area had been electrified–but there was no electricity to light the darkness south of Half Moon Bay. As the sun dimmed and the shadows took hold of the night, San Gregorio and Pescadero were stilled. An occasional flash of light from the headlights of a speeding rum-running automobile ws the only break in the night. Farmers and housewives depended on coal oil lamps for the routine tasks of living. 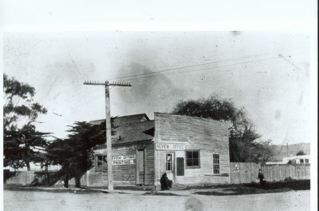 With an office on Main Street in Half Moon Bay, the northern Coastside was served by the Great Western Power Co. (GWPC) of California. “Nowadays a good continuous supply of electric power is as necessary in the home and in the kitchen as it is in the artichoke field,” the Half Moon Bay Review proclaimed in 1923. GWPC was committed to the spread of electrification, as was its powerful arch-rival, Pacific Gas & Electric Co. PG&E kept an office in Redwood City but it was known on the coastside for its aggressive ads in the Review. In the early 1920s many rival power companies were elbowing for business room in California. It wasn’t extraordinary for two different power companies to light the opposite sides of a street in the same town. The struggle to electrify the south Coast was just part of a larger competition between PG&E and GWPC. Great Western had long served the Coastside–and in early 1925 asked the County Board of Supervisors to grant it a franchise to expand power lines. The request was denied. In late June 1925 having been denied the franchise, Great Western had no choice but to enter into a race with PG&E.Which company would plant power poles fast enough to reach electricity-starved Pescadero first? The prize could guarantee supremacy on the Coastside.